Today I took part in the Worldwide Vegan Chalk Bomb with my Sister-in-law and our new friend Meredith from Vegans of East London. People took part in events all across the world to spread the vegan message. You can check out everyone’s work by searching the hashtags #veganchalkbomb and #veganchalkchallenge on Twitter and Instagram. We set up camp outside Shoreditch High Street Overground Station and got to work. A fellow vegan who was working so couldn’t join us brought us cupcakes from Vida Bakery to spur us on! After all that chalking we were getting hungry so we decided to head over to Broadway Vegan Market which was holding its first event. 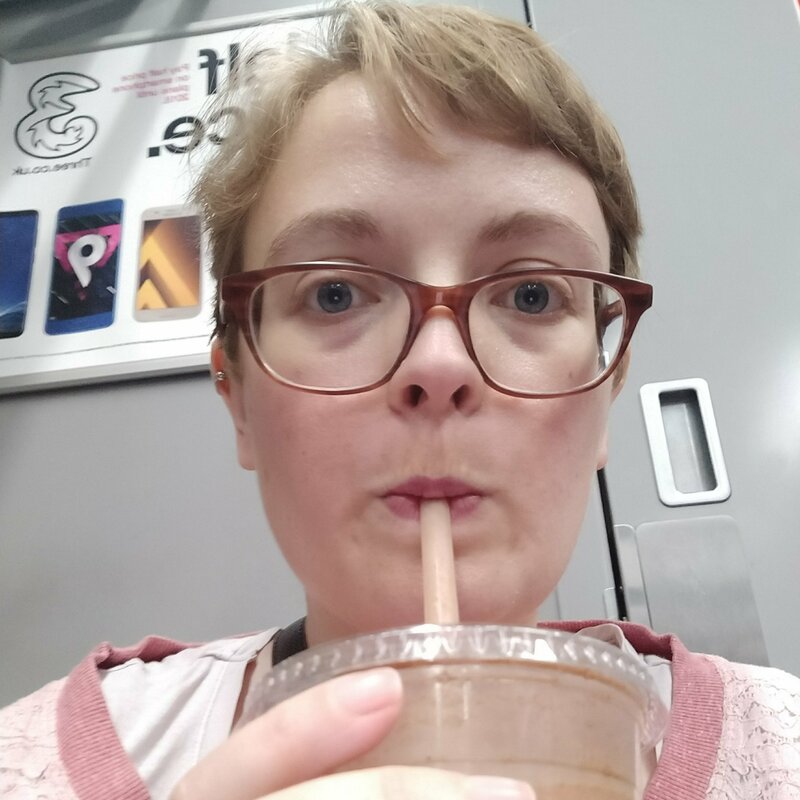 We decided to walk and had a lovely time nosing in the cute little shops along the way and even got chatting to another vegan lady who was working in one of the shops. It’s seems like it’s another day another vegan market at the moment and I’m definitely not complaining! 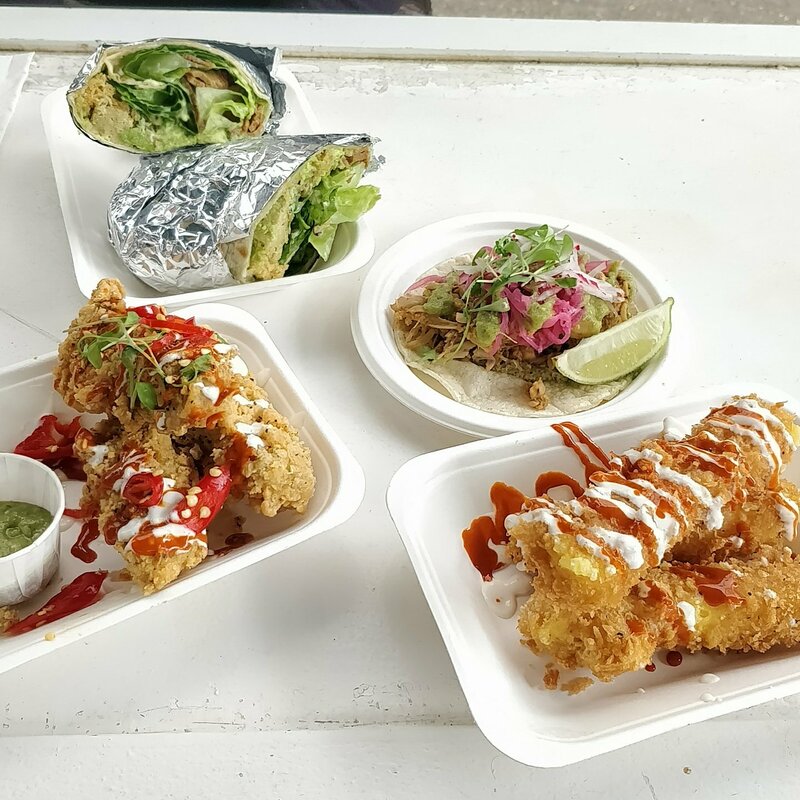 Every Saturday you can choose between Broadway Vegan Market and Hackney Downs Vegan Market (or go to both if you’re being greedy!) and tomorrow (1st October) sees the launch of Walthamstow Vegan Market. 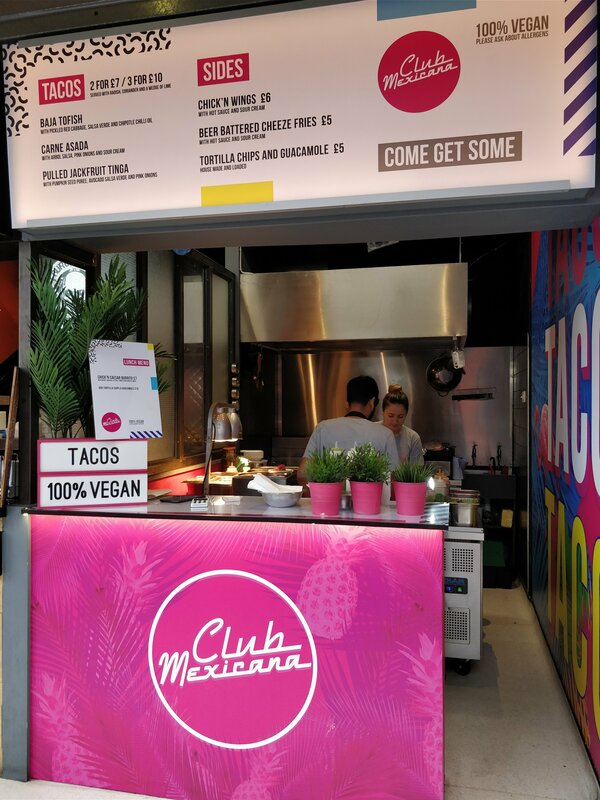 Many of the traders were also at Vegan Nights a couple of days previously (which I wrote about here) so I had a pretty good idea of what I wanted to try. I chose a noodle salad from Eat Chay which came with Korean barbecue pieces and chick’n and lemongrass pieces. It was really great and the vegetables made it really fresh tasting. My Sister-in-law chose to order from Spice Box (after much deliberation!) and got this box of tandoori cauliflower, jackfruit tikka masala and sweet potato curry. I tried a little bit of each (of course!) and it was damn tasty! I couldn’t go home without getting something for my Husband so I picked him up a pizza slice and a chocolate walnut brownie from Vegan Sweet Tooth. There were loads of other lovely looking stalls and I hope to make my way round a few of them at upcoming events! Have you taken part in any vegan chalking? Or did you attend a delicious vegan food event this weekend? Let me know in the comments below. 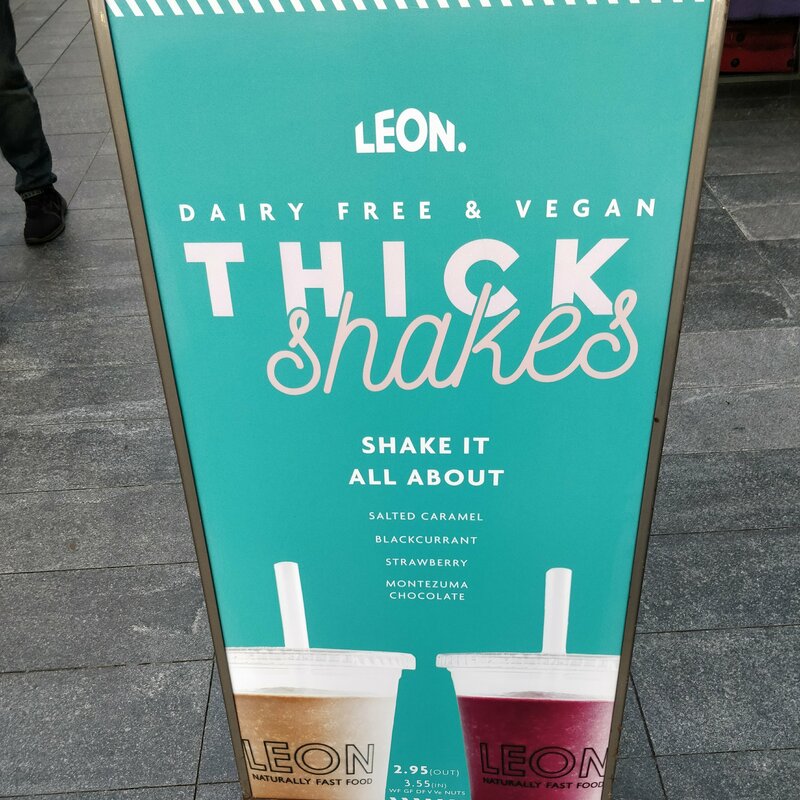 When I saw Fat Gay Vegan’s blog saying Leon were trialling vegan milkshakes in their Spitalfields store I was over the moon as this is practically on my way home from the office! Unfortunately they were out of salted caramel so I went for the chocolate. It was really rich and chocolatey. The texture reminded me of a Starbucks frappaccino. I hope the trial goes well and they roll these out to all stores. I look forward to trying the different flavours. 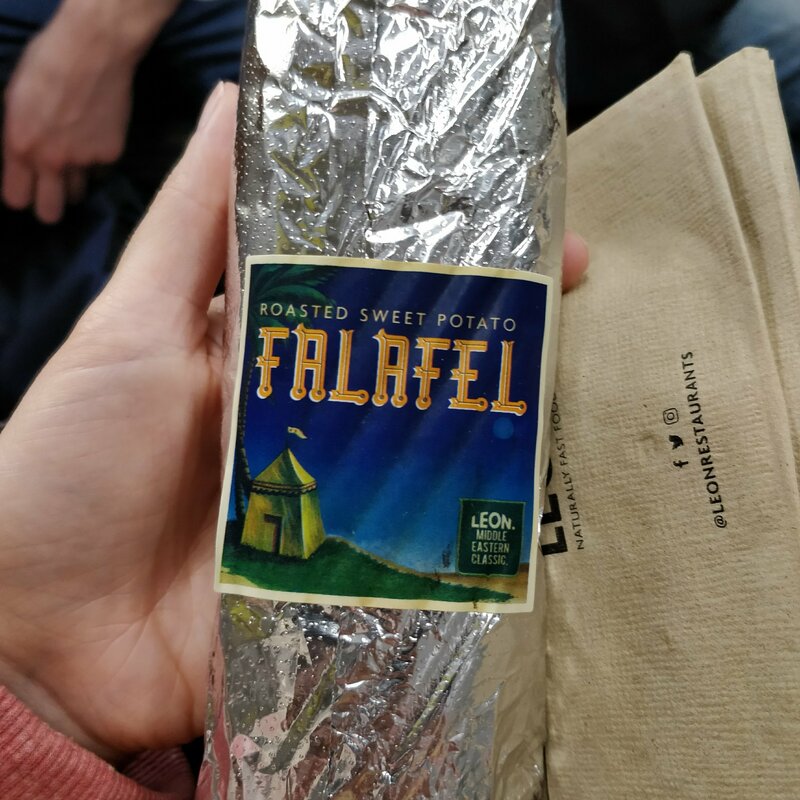 Leon have a few savoury options so I went for a falafel wrap to eat on the way home before I was due to do a couple of hours activism. It was really tasty with peppers, houmous and lovely big pickles. Leon is definitely my go to when I need to get some food on the go. Have you been to Leon? What did you think of their vegan options? Would you like to try their milkshakes and see them rolled out? Let me know in the comments below.